Fangames honestly don’t have the greatest of reputations throughout any of the game-making communities that I’ve been part of. Often, they’re made by overambitious beginners as their first project, haphazardly slapping graphics and sound together in a representation of the original work that could be described as crude at best. (I know that’s what all mine were like.) On the other hand, there are also the rare gems of fangames thought up by really dedicated people which show true love for the source material and get everything just right while putting their own spin on to the gameplay and world. 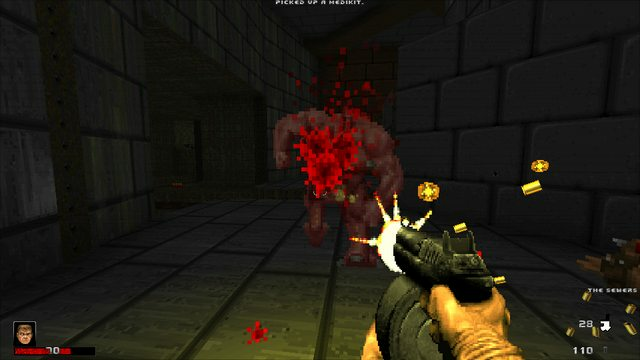 Hocus Pocus Doom is a shining example of the second kind. It’s based on the 1994 game Hocus Pocus, one of several thousand side-scrolling platformers published by Apogee Software during the golden age of PC shareware. The original game is the story of a young apprentice wizard who is tasked with retrieving a vast number of magic crystals from hostile castles in order to drain them of their powers, thus earning his place on the Council of Wizards and the respect of his tutor Terexin. 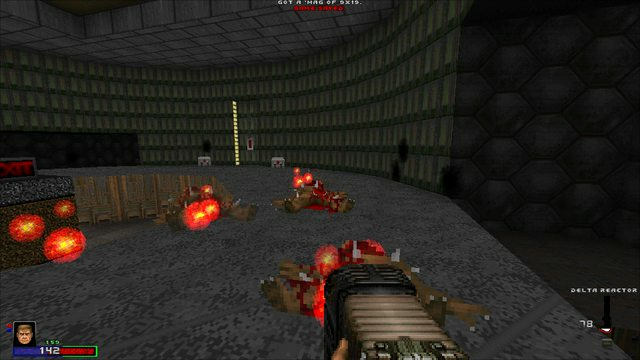 This incarnation by Ravage and company sends you on the same quest again, this time translating the entire game to 3D within the confines of the GZDoom engine. 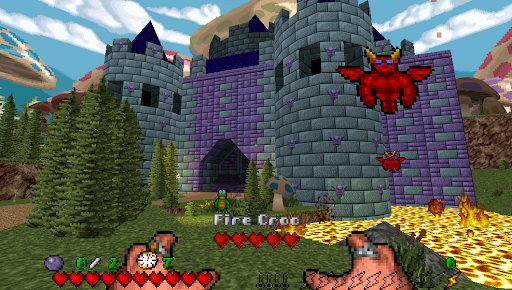 Each level sees you fighting your way through one of a number of charming Lego-brick castles with the aim of finding all the magic crystals. There are usually four to six of these on each level, and once you’ve grabbed the last one you’re instantly teleported off to the next map - as a result, the levels are all impressively nonlinear. Some of them have a fairly obvious progression to them, but others are entirely hub-based and let the player decide the order in which to complete the paths. Along the way you’ll have to deal with physical obstacles like lava, spikes and switch puzzles that alter the castle’s architecture, and you can zap the various magic creatures that get in your way with your little lightning bolt spell - the monsters are also imported from the original game and consist of a variety of crawling or hovering enemies that may or may not be able to fire back at you. 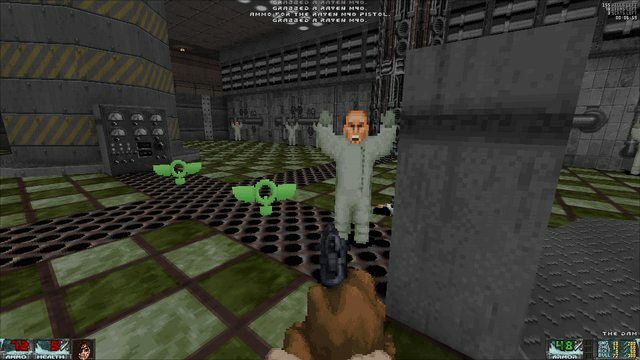 The game casts off most of the things that we’ve learned to take for granted in Doom and reworks them to suit the game that it’s based on. On your HUD, you’ll find the number of crystals that you’ve collected so far, the time you’ve taken to do it, and your current inventory of keys, health and magic. 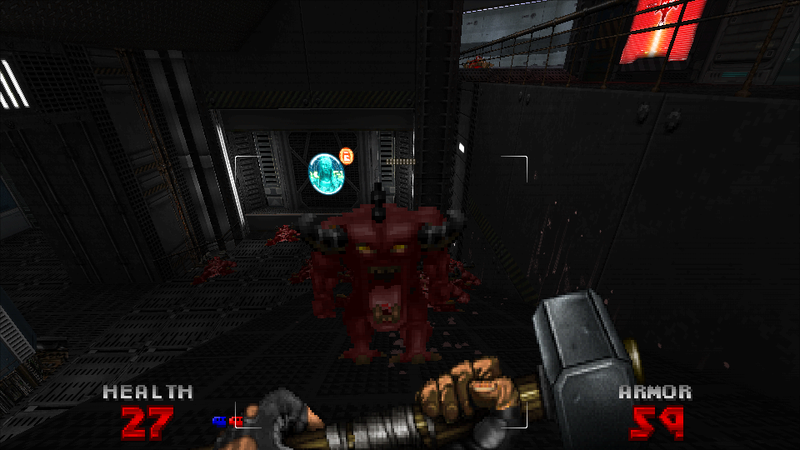 Unlike the health and random damage system that Doom players are familiar with, here you get a bar of exactly ten hearts (though it can be temporarily extended) and enemies will take off one of those with each hit. You have to be cautious, though, because you’ll encounter enemies that can take off more than one heart very quickly, meaning that your comfortable ten hit points are reduced to an actual maximum of five. You start off with just one lightning bolt on your magic meter, though it can be extended to ten as well - each of these represents another shot before you have to wait for them to recharge, making it possible to fire faster as you collect more of them. 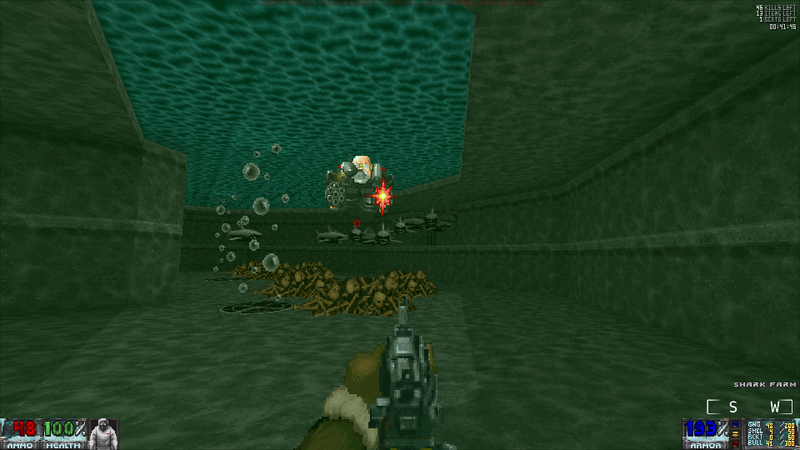 You’ll also encounter potions in the levels that give you extra abilities temporarily, such as shots that explode and produce more shots on impact, or a stream of rapid fire - very useful for dealing with a suddenly-appearing horde of rabid penguins. The familiar Doom level statistics are also replaced - a monster count still exists, but instead of the usual “items” tally for powerups, you’ll be judged on the number of treasures that you picked up in a level, and will net a large bonus if you manage to recover all the various crowns, goblets and other trinkets that have been left lying around. 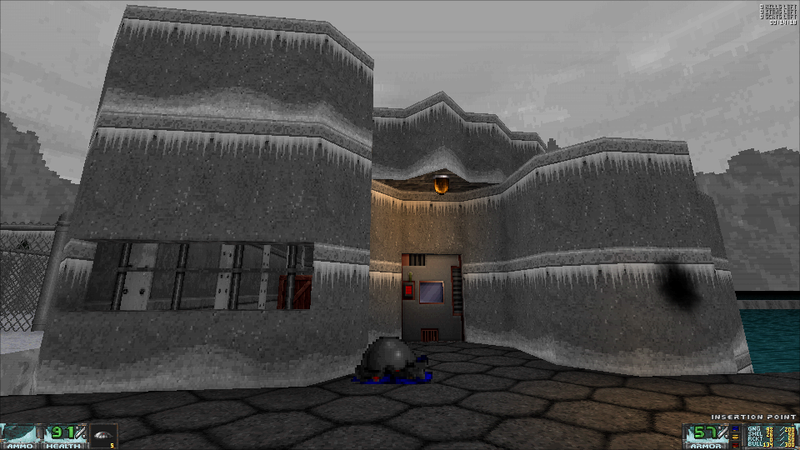 This number effectively represents the number of secrets that you’ve found in the level as well, as treasures can be hidden in out-of-the-way areas or behind breakable walls (which are cleverly created using shootable objects with models attached to them). Some areas use the Z-axis as part of the puzzle and have you carve out a ladder for yourself out of shootable bricks to get up to the treasures on a balcony above, which makes you feel extraordinarily clever the first time you succeed. Throughout the game, the sheer level of attention to detail borders on psychotic. The environments of the original game are all present, with graphics faithfully adapted from the 2D version and reworked to produce three-dimensional levels that suit the first-person view perfectly while still evoking the feeling of the original. Even the parts of the game that you’d think wouldn’t really be necessary are meticulously recreated - treasures sparkle by spawning some shiny particles after they’ve been sitting around for a while, monsters burst into little bits of dust, every little effect that existed in the 1994 game can also be found in here. 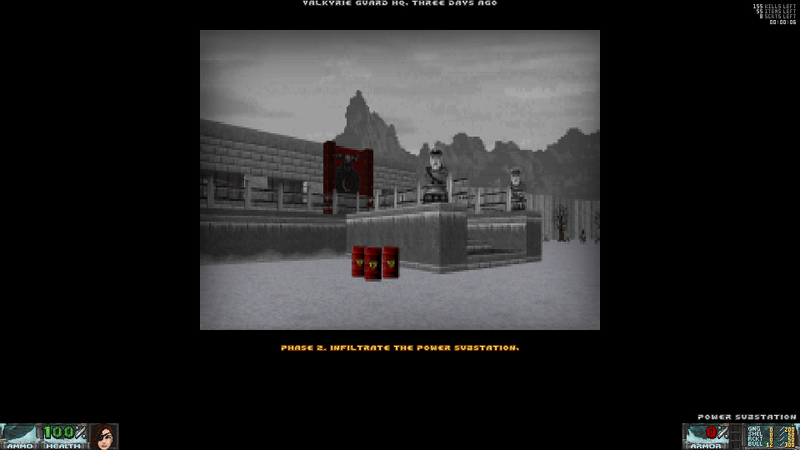 It would have been absolutely fine to have made a death sequence like Doom’s where you just keeled over and restarted the level, but instead the exploding player and interstitial summary screen from Hocus Pocus are thrown in for good measure. The architecture, too, maintains an incredibly high standard throughout - the use of 3D floors, ramps and some models all come together to form an imposing array of corridors, towers and ramparts in every different style of level, with the blocky bricks of the castles blending in with angular outdoor environments. 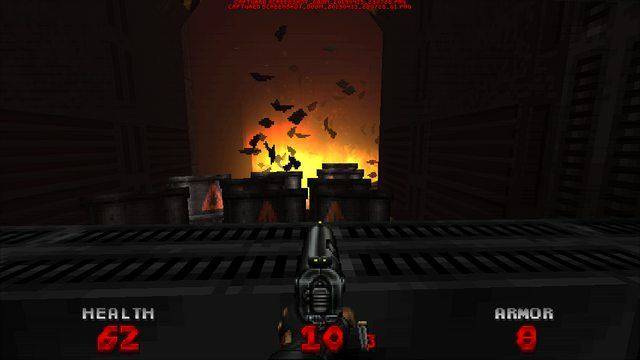 The levels are varied and have interesting characteristics per style that set them apart from each other - in fact, they’re often rather better than the original game’s levels, which had a habit of using very long repetitive corridors in many places. Look up at any point and you’ll see intricate patterns on the high vaulted ceilings stretching off well into the troposphere. Considering that this mod manages to keep this kind of standard up for forty levels, it’s a truly impressive feat. If this TC has any weaknesses to speak of, it’s really just as a result of its adherence to the source material - for example, it faithfully recreates the original game’s habit of having monsters materialize out of thin air when you’re already a bit too close for comfort, often resulting in a monster teleporting right into a player’s face leaving them no chance to prepare or pick them off tactically. Additionally, Hocus knows surprisingly few spells for a wizard (but then, that must be why he’s an apprentice) - having only one main weapon available can get a little dull, especially as you start every level with it downgraded back to its lowest level again and have to build it back up. The cumulative weapon upgrades don’t increase the power of your shots but just the number you can have in the air at one time, eventually making it possible to fire as fast as you physically can - and while I was okay hammering the fire button for hours on end in the 90s, these days it causes a bit of repetitive strain on my creaky old joints. 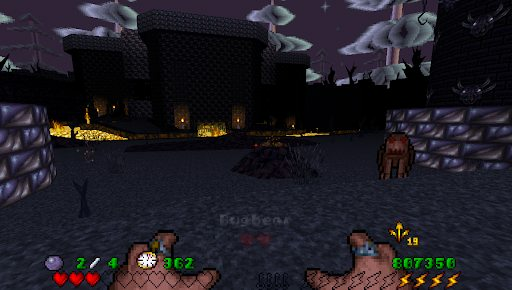 Otherwise, Hocus Pocus Doom is a truly amazing use of the GZDoom engine, and could easily be mistaken for a commercial release or an official remake. It requires an IWAD to run, but I honestly can’t think of anything that it uses from its Doom roots. 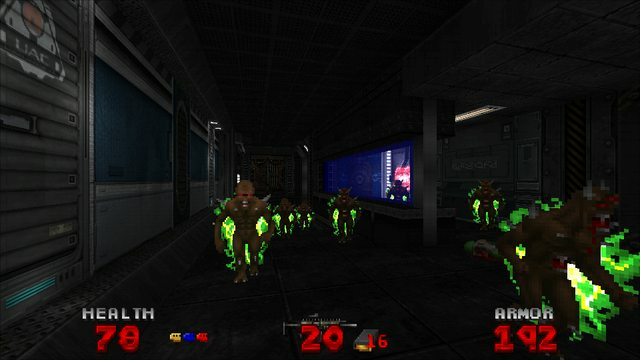 Indeed, if Hocus Pocus Doom didn’t come as a pair of PK3s that you have to drag it on to your gzdoom.exe, you’d be hard pressed to notice that you were playing a Doom mod at all - the transformation is admirably complete, blending a wide variety of different features possible in the engine to produce something that feels very authentic. It’s a remarkably faithful translation of a classic platform game into a new form in which to enjoy it all over again. 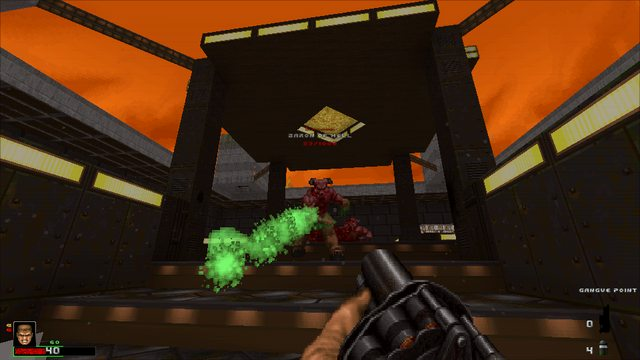 The weapons are the centerpiece of this mod. There are nine of them. 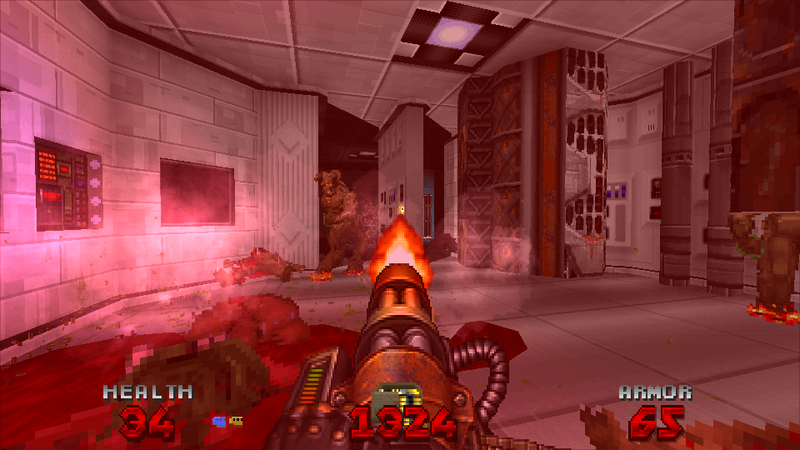 They roughly conform to the standard Doom weapon formula, taking a bunch of liberties. These weapons are known as an example of how to make weapons feel right. The theme is futuristic, so Accessories to Murder probably go better with tech levels, but they won’t look out of place in the medieval setting, too. Accessories to Murder are meant to be played with mouselook on. The power balance is shifted in favor of the player, but this weapon set is not overpowered. The game remains a challenge. Most of the weapons need reloading, and, as the author of the mod warns you, it’s clip-based. This means that you lose the ammo remaining in the weapon if you reload. This forces the player to be more mindful with reloading. Your melee weapon of choice is the Sledge Hammer. It is one of the two starting weapons. Why bother hitting enemies with your fist if you are able to carry around a heavy chunk of iron on a stick at all times? Look out for an upgrade for the Sledge — the Mjolnir Device (which replaces Berserk pack). This contraption causes your unfortunate targets being struck not only by the iron but also by electricity. Mjolnir Device also heals the carrier to 100 health (just like Berserk) for some reason, but I doubt anyone would complain. The second thing that you have readily available is Marston KP-8 10mm Handgun. It’s a handy gun that allows you to fire as fast as you are able to pull the trigger. It holds 10 rounds. Nothing much can be said about it, except that if you are lucky, you can find another one. In this case, you will fire them akimbo. Taiga Revolver is another weapon you have in Slot 2. It’s a powerful gun that has two fire modes: primary (single shot) and secondary (fanning), which is faster in the expense of accuracy. Taiga holds 6 rounds. Two shotguns are available. Unlike the original Doom, they swapped roles: double-barreled shotgun (Maxwell Labs 1-2 Special) is weaker than single-barreled (M2097 “Bicentennial”). 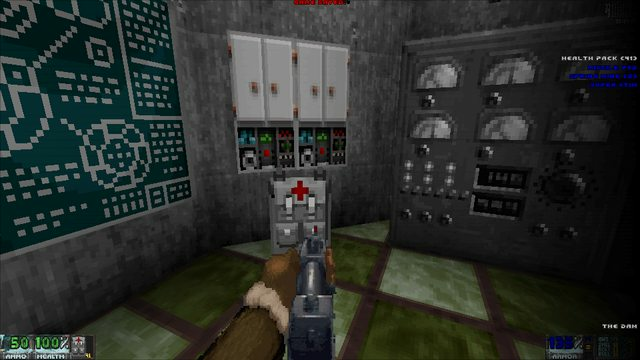 You can fire Maxwell Labs’ barrels either one by one or two at the same time. M2097 “Bicentennial” not only has much better accuracy, but it is also actually a good distance weapon, and it can be aimed down the sights. Kurdd & Schaumers R90-PCW Assault Rifle is a robust multi-purpose weapon. It quickly disposes of your enemy on short and middle distances. It holds 20 rounds and has holographic sights. The accuracy could be better, but it’s still effective. Corbex @99 Emplaced Miniature Anti-Tank Weapon (EMAW) is a rocket launcher. It holds 8 rounds, and it means that it is capable of destroying almost any enemy before reloading. The rocket trajectory is a fancy spiral, so the destroying is conducted with style. It’s hard to aim this monster of a gun, but you rarely need high precision while launching explosives. Just point to the general direction of your enemy, and you should be fine. The original Plasma Rifle replacement is a surprise — it’s not an energy weapon, it’s Makoto Arms SOBAT 17.5 Infantry-Fighting Rotary Cannon. It’s a mighty weapon, demolishing anything that happens to stand that side of its barrels. The suppressive fire is enough to keep the enemy occupied with feeling pain. The last, but not least, is the BFG, Big Fu… Wait, no. It’s the Bergmann Field Generator. It comes in handy in situations when something somehow survived the application of the previous arsenal entries. The Bergmann Field Generator has a huge blast radius and is especially effective against multiple targets. Weapons have a dedicated ww-doomnukem-lore.txt lump inside the mod, so if you want to know more about them, check it out! There are two of them: visor and minimalistic. Visor HUD is pretty and immersive, but if visor HUDs are not your thing or it takes too much screen space, there is a minimalistic one. Also, in automap mode, the HUD displays how much ammo you have for each of the weapons. Monsters are a ragtag team. This is a part of a mod that still looks pretty much WIP: some enemies are complete replacements, some of them are mere reskins and may have slightly altered behavior, and Spider Mastermind is not changed at all. Interesting points are that Baron Of Hell and Hell Knight (now called Tribal Knight) now have more differences. Tribal Knight’s usual attack is weaker but faster, and sometimes Tribal Knights can use baron’s attack. Imps come in three variants. The difference is mostly in the looks, they have slightly different attacks. Imp is the only demon type that is randomized. Cacodemon behaves like the original, but its death animation may make you chuckle. It doesn’t fit the more serious theme of the mod. Or maybe it’s the death sound that is guilty? Arachnotron is replaced with Hazmat Trooper with slightly changed behavior. 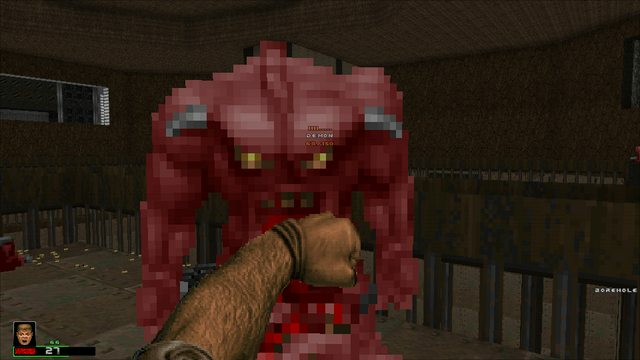 Arch-vile is replaced with Vore from Quake. It shoots powerful exploding seeking missiles. Pain Elemental is replaced with Bog Elemental, which looks similar, but instead of emitting lost souls, has two kinds of projectile attack. Also, it releases poison clouds on death. Because monster lineup feels unfinished, one may want to play Accessories to Murder together with another monster pack. This setup is totally playable, with the only exception that the player won’t get akimbo Marston KP-8. A lot of attention is given to gun sounds, explosions, fire, and smoke. These things are top-notch. They constitute a lot of what Accessories to Murder so satisfying to play. This mod incorporates Droplets by Josh771 (formerly known as SidDoyle), so the good amount of colorful blood is guaranteed. One of the distinct elements of this mod is the use of voxels. Almost all the pickup items are represented with them, and even empty shells of some weapons, including the ones from Makoto Rotary Cannon. This looks cool but may cause the frame rate to drop on some machines. As previously mentioned, there’s a lot of new sound going on in this mod. 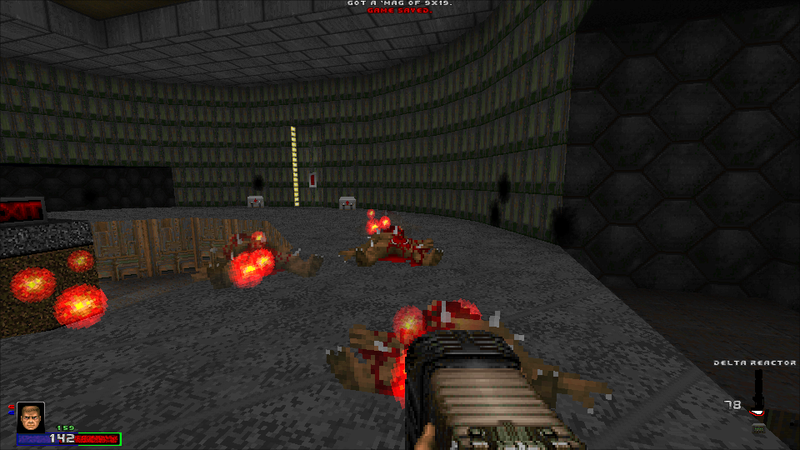 The weapons all have distinct sounds for their reload, fire, pick-up and raise animations. 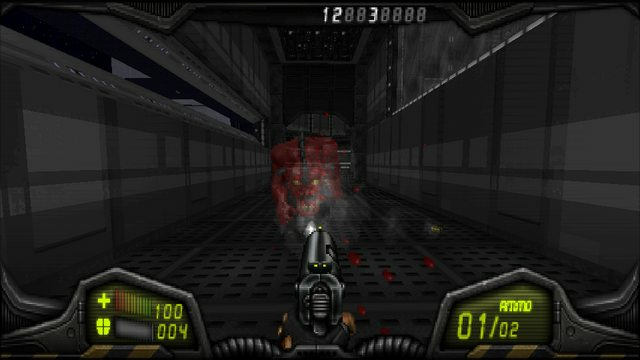 A common theme for all the firing sounds is, that they carry a lot of punch, which really plays well with the metallic, raw look of the weapons. Some monsters audio queues have been redesigned. I find the new zombie sounds to be somewhat silly, but I’ll write that down as a matter of personal taste. One thing can be said about the length of the death sounds. 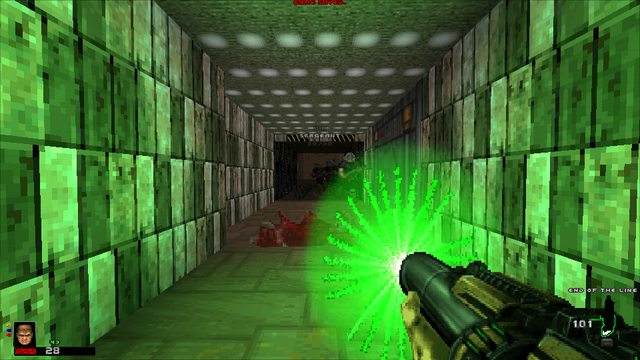 Some new sound files are much longer than the originals, which in some cases result in a very chaotic arrangement of gurgling / garbling when blasting through a room of zombies. Whether this is good or bad is once again subjective. 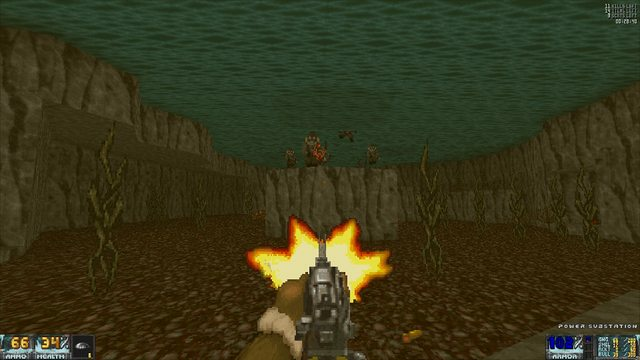 As far as I’m concerned, longer death sounds work better with bigger monsters, since it’s less likely that 10 Barons of Hell go down within seconds of each other as opposed to Zombies. Another example of a redesign is the Spectre (now called Mech-demon). Graphically the Spectre no longer appears as “old-school tv-static”, but instead is completely invisible. The only thing that gives the Spectre’s whereabouts away, is the dust and sounds from its footsteps. Personally, I think the addition of sound vs. the subtraction of visuals works very well. For most of the power-ups and reward sounds wildweasel has gone with what I like to call an “arcady” style. The “secret found” and automap pick-up sounds in particular are composed of synthesizer jingles. Short, sweet and to the point. Nothing more to say really. Minor nitpicks can be pointed out, such as the pick-up sound for the cigarettes has a smidgen of noise at the end, which is noticeable when picking up several of them. Also, some of the firing sounds are cut short before the reverb fades out completely. On the other hand there are some details which work really well. For instance, Doomguy has 3 different tiers of pain which works in the same manner as in Quake. The lower the health when hit, the more agonizing the sound. Accessories to Murder is a mod that is totally worth playing. It contains elements that make it stand out from other mods. The arsenal is an unforgettable experience. But the quality of the different parts of the mod is uneven, especially in the monster department. It would be awesome if the author revisited the mod at some point and filled the few remaining gaps. 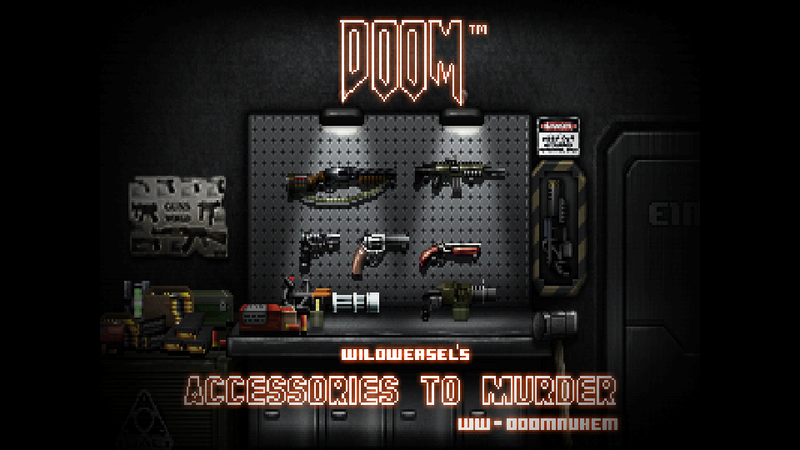 You can download Accessories to Murder by the links provided in the original post. I love Undertale. If you've performed the incredible feat of not having heard of it, Toby Fox's adventure from 2015 is a wonderful mixture of whimsical nostalgia, charming characters, innovative gameplay and having the worst nightmare of your entire life. The thing responsible for that last part is a being called Chara, who is an evil presence within the game’s world and is implied to be influencing the player's decisions if they choose to resort to violence. Back in 2016, Ribo Zurai saw Chara's potential in a game where violence is very much the first resort, and created Determination. 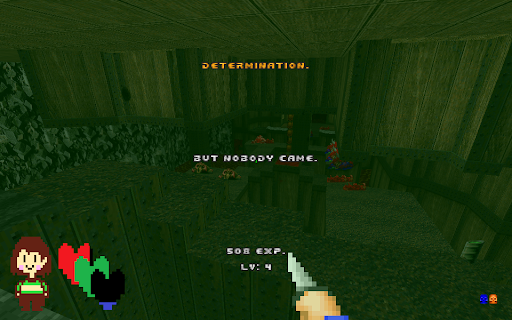 This is a WAD that replaces the player character with Chara themselves (itself? ), armed only with their rosy cheeks and a small knife that can one-hit kill everything in the entire game. 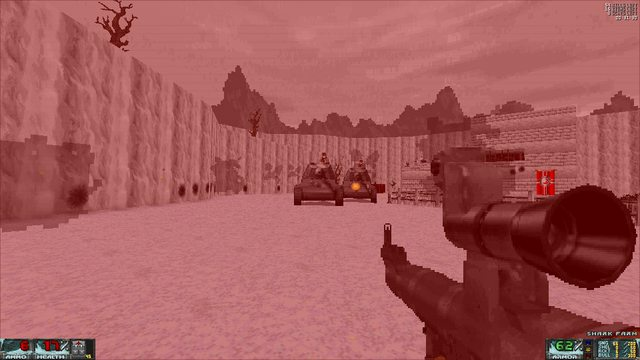 This mod, as the author says, is for people who would like to enjoy a bit of mindless genocide. 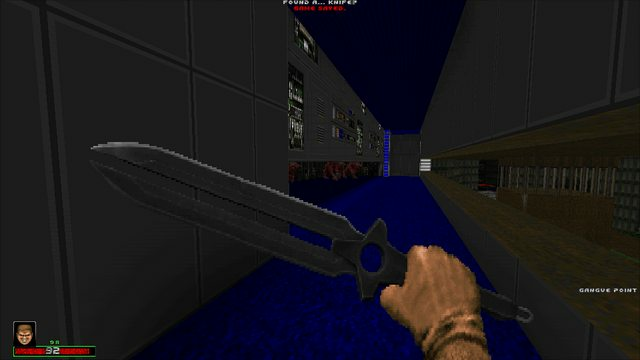 All weapons are removed from the game and you’re only able to attack by stabbing a small distance in front of you - Chara’s weapon the Real Knife will instantly destroy even the strongest bosses, but needs to get right up against them to do it. 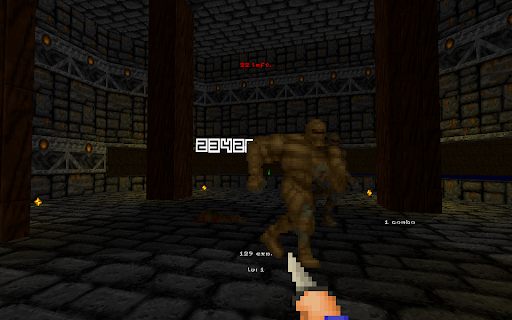 The maximum health of the player is also doubled to 200 to compensate for Chara having to take a bit of a punishment to get up close to enemies. I was about to complain that the sleeve visible below the knife was coloured blue while Chara’s top is obviously green, but then realized exactly why that was, and if you’re a fan of Undertale you may have just experienced the same sickening feeling that I just did. There’s a bit of HUD work to replace the standard counters with Undertale-style hearts that fill up depending on your health and armour. The green third heart in the middle keeps track of your stamina, which is depleted each time you make a stab and then regenerates, but you have so much of it that the limit is never realistically going to come into play. 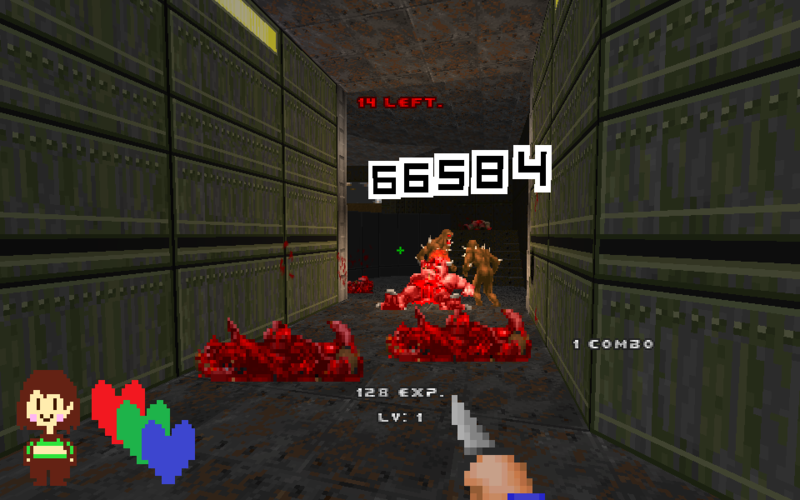 Placed front and centre of the new HUD is a counter that keeps you updated on you how many monsters are left, counting down as you burst them one by one and acting as a continuous reminder of Chara’s lust for genocide. 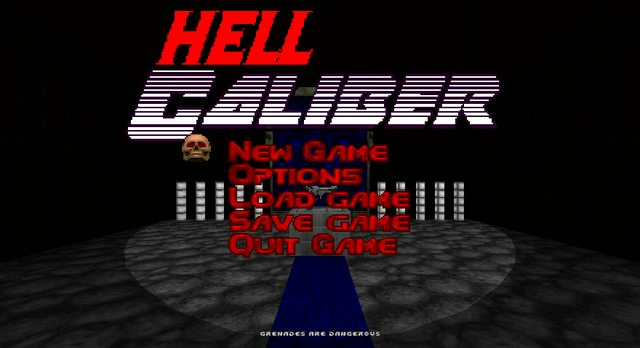 When you’re the last thing on the level left alive, the music cuts out and is replaced with a deeply unsettling drone, a horribly distorted version of the Undertale theme that surely plays in Hell’s waiting room. You then move to the exit and continue your slaughter. It's not something you're necessarily going to want to play through an entire megawad with, but it's an interesting novelty of a crossover, and a great little example of what you can do with just a bit of Decorate and ACS.